Zorgbedrijf Antwerpen (ZBA) offers a wide range of services to Antwerp seniors, to families with young children and to families who need care support. It is the largest player in the Antwerp healthcare sector with more than 4.350 motivated employees who help 17.000 customers every day. The company counts 44 service centers, more than 3300 service flats, 18 residential care centers, 7 youth care centers and specific home services. Zorgbedrijf Antwerpen has a very innovative vision, they believe in the success of blended learning and are open to stimulate their employees to go digital. That’s why we were excited to collaborate with them. As this was a non-SAP e-learning project, the project scope was slightly different than on an IT-focused project. We were thrilled about the project as it was out of our comfort zone. Starting from a change process within the customer service department, a team of 60 customer service employees needed to enhance and expand their skill set. Our goal was to create an online training for customer counselors to familiarise them with the products and services, to test their knowledge and to help them applying their knowledge to different customer questions. Creating a commercial or soft-skill training was not within the scope as these two topics were covered in a different part of the learning journey. At Amista, three SAP Enable Now Learning Consultants were responsible for a proper rollout of the project. At Zorgbedrijf Antwerpen three key-users were appointed. In close collaboration with Katleen Anthoni, Digital Learning Expert at Zorgbedrijf Antwerpen, we made the storyboard and defined the structure of the different modules. Two consultants developed the training, one was appointed as the designer. Katleen took responsibility as SPOC (single point of contact) during this project. She centralized all information between the project team and the business. As we had a limited timeline, open communication was key to succeed. Initially, we noticed the expectations were not completely clear on both sides. To avoid misunderstandings, we organized several intensive workshops. When the project actually started, everything ran smoothly and it was fully rolled out in 6 weeks time, followed by a test phase. 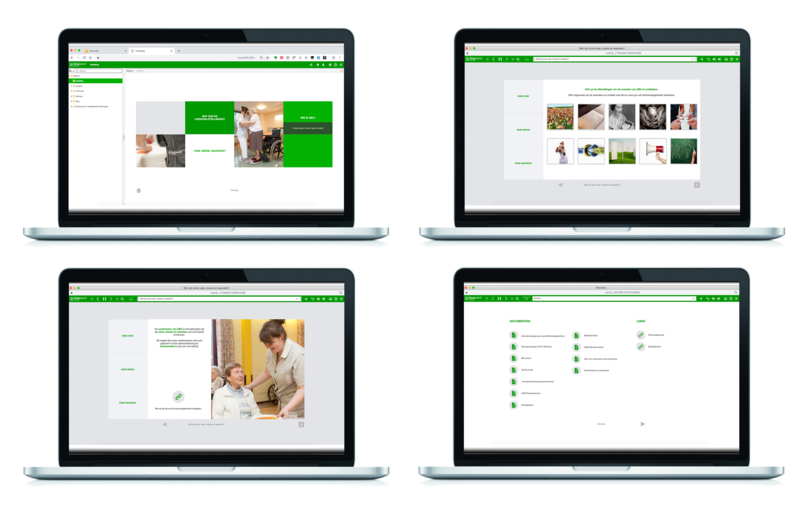 By producing straightforward e-learning modules with a user-friendly look & feel, our target was to convince customer service employees about the online experience and the flexibility and comfort of an e-learning library. We linked the modules to ZBA’s service offering catalog. As ZBA is using SAP SuccessFactors as Learning Management System, we made SCORM-exports of the e-learning modules to integrate them. As all customer service employees use SAP SuccessFactors, this connection was an essential part of the project. Additionally, we based our templates on the corporate design of Zorgbedrijf Antwerpen. At Amista, we can conclude it is important to demonstrate our expertise as from the beginning to put all noses in the same direction. We always set clear expectations and goals. “The biggest advantage of online training is that it is always and everywhere accessible. Our employees can consult the training at the customer’s home or on the go. Without the need to learn difficult topics by heart, the learning library provides support and creates awareness. It is an interactive and dynamic way of learning. The test users were very positive about it and the project was recently rolled out successfully in the customer service department. For Zorgbedrijf Antwerpen, online training is a great addition to their face-to-face skill training and classical workshops. The results are captured in SAP SuccessFactors for further follow up. The Digital Learning Expert can track who has completed which training modules. As we trained some key-users on how to work with SAP Enable Now, they will create own recordings and add additional modules to the library in the future. We would like to thank Zorgbedrijf Antwerpen and in particular Katleen Anthoni, Hans Van Lint and Bart D’Hondt for their trust and cooperation.